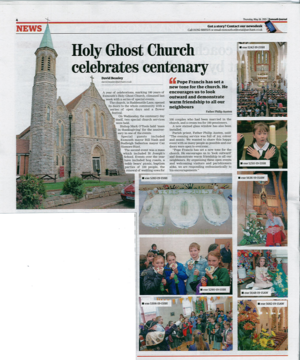 2015 was our Centenary year and we held many events to celebrate the history of the church and the parish. From Cream Teas to Baptism parties and the renewal of wedding vows for 100 couples who were married in the church there was something for everyone to enjoy. You can read our centenary news stories from our archives here. We were grateful to Simon Grimmett for his time and expertise in recording our Centenary Mass which you can view below or on YouTube. 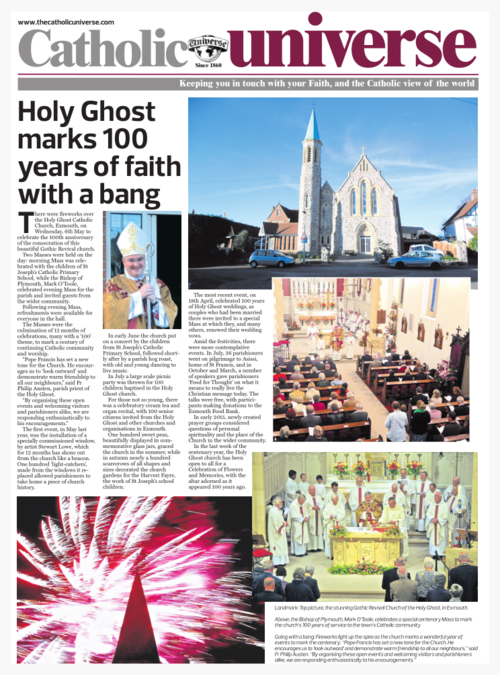 Finally we were lucky enough to make the front pages the Catholic Universe and one of our local papers – read their reports by clicking on the images below.